Now get your text printed with MackMark and get the final product ready to be delivered to your guests. Only applies to products purchased from MackMark. Price Inclusive of 2 Inserts OR 1 Scroll and 1 Envelope. Important Things to know about Bulk Order: 1) How do I submit the text to be printed on the Invitations? Once the Order has been placed, we will send you an confirmation email along with further instructions on how to submit the text. 2) What is the procedure for proof? Once we receive the text, our professional designers will work on the text provided and a proof will be sent to you in a Black and White pdf file for approval within 2 business days. According to your Feedback/Alterations/Suggestions we will incorporate the changes and send you a corrected proof for approval. Once approved, the text will be printed and shipped to the Shipping address provided. 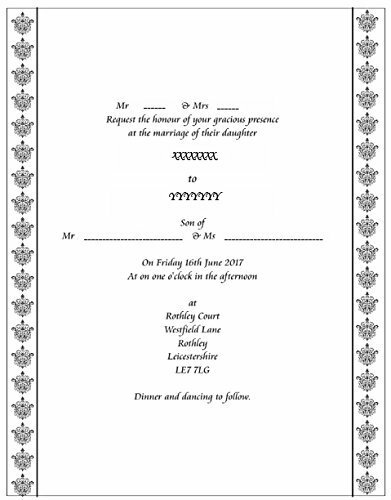 3) How many languages do you print the Invitations in? All. Yes, we do print the Invitations in all or any language as per your requirement. If a particular language/font is not available with us then you just need to send us the text in a high resolution jpeg file and we will print it for you. However, one order is allowed to print only in one language. So if you would like to print the Invitations in 2 different languages then kindly place 2 different orders. 4) What colors can I use for printing the text? Any color of your choice. We will provide recommendations as per our experience of best color combinations once the proof is approved and you can then decide which color would you like to print on the Invitations. 5) What is the turn around time for Printed Invitations? Most of our products are manufactured, printed and shipped within 5-6 business days from our warehouse and it takes an additional 3-4 business days in transit. The total turn around time can be 8-10 business days depending upon the destination country. Just add 1 pc of Text Printing in your cart with your Invitations and get the final Product ready to send to your guests! Price Inclusive of 2 Inserts OR 1 Scroll and 1 Envelope. We'll design and send you a digital proof before Printing! If you have any questions about this product by MackMark, contact us by completing and submitting the form below. If you are looking for a specif part number, please include it with your message.